Ustad F. Wasifuddin Dagar lives and works in Delhi. Son and nephew of the Dagar Brothers (Ustad N. Zahiruddin and Ustad N. Faiyazuddin Dagar), Wasifuddin Dagar started his musical training at an early age, pursued it with great dedication along with his formal education. He was taught according to the time-tested oral tradition followed in his Gharana and today he teaches students in the same way and today his students perform in in India, America and South Africa. 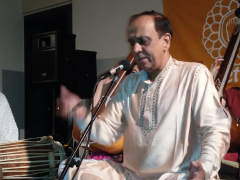 He is the President of the Dhrupad Society and with the annual Dhrupad Samarohs and regular Guru-Shishya Parampara Festivals that he organises, he has perpetuated the oral tradition of teaching that was threatened due to changing times and musical tastes. Through his music education sessions with younger people and his tours and CDs, he contributed to the promotion and documentation of the Dhrupad style for music lovers and scholars. In 2003, his CD for the UNESCO helped bring Dhrupad back on the world music scene. In 2010, the Government of India conferred upon him the Padma Shri. Atul Dodiya lives and works in Mumbai, India. He graduated from the J. J. School of Art of Mumbai and continued his studies at the École des Beaux-Arts in Paris. 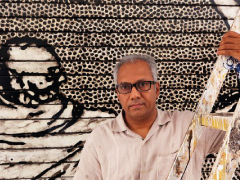 Known for his paintings, drawings, and installations, Atul Dodiya’s works are populated by diverse traditions in painting, the written words, images from the media and of saints, legends, national history, political events, traumata and autobiographical narratives. Selected recent solo shows: Japan Foundation Asia Centre, Tokyo, 2001; Reina Sofia Museum, Madrid, 2002; Contemporary Arts Centre, Cincinnati, US, 2013; National Gallery of Modern Art, New Delhi, 2013; Bhau Daji Lad Museum, Mumbai,2014. He participated in major group shows, among which the 1st Yokohoma Triennale, 2001; 51st Venice Biennale, 2005; Documenta12, 2007; 7th Gwangju Biennale, 2008; 3rd Moscow Biennale, 2009; Biennale Jogja XI, 2011; 7th Asia Pacific Triennale, Brisbane, 2012 and Kochi Muziris Biennale, Kochi, India, 2012. A major monograph on his work published by Prestel Verlag and Vadehra Art Gallery, was released in January 2014. He is represented in several collections, including National Gallery of Modern Art, New Delhi and Mumbai; Philadelphia Museum of Art, Philadelphia; Museum of Old and New Art (MONA), Tasmania, Australia; Queensland Art Gallery, Brisbane, Australia; Pompidou Centre, Paris; Tate Modern, London; Museum Victoria, Melbourne, Australia; Museum M+, Hong Kong. Anju Dodiya lives and works in Mumbai. She studied at the J. J. School of Art, Mumbai. 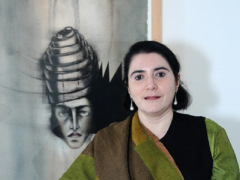 Anju Dodiya has dedicated herself to the project of self-portraiture, the representation of the self as a questor in the labyrinth of art and life. In 2007, she embarked on an ambitious site-specific installation, “Throne of Frost” at the Lakshmi Villas Palace, Baroda, India. Selected recent solo shows: Gallery Chemould, Mumbai, 1991, 1996 & 2001; “The Cloud-Hunt”, Vadehra Art Gallery, New Delhi, India, 2005; Bose Pacia, New York, 2006; “Throne of Frost”, Lakshmi Villas Palace, Baroda, India, 2007; “All Night I Shall Gallop”, Singapore Tyler Print Institute, Singapore & Bodhi Art, Singapore, Mumbai, New York, 2008; “Necklace of Echoes”, Vadehra Art Gallery, New Delhi, 2010; “Face-off (After Kuniyoshi)”, Galerie Daniel Templon, Paris, 2010; “Room for Erasures”, Chemould Prescott Road, Mumbai, 2012; “Imagined Immortals”, Vadehra Art Gallery, New Delhi, 2015. Selected group shows: “ARS 01, Unfolding Perspectives”, Museum of Contemporary Art, Kiasma, Helsinki, Finland, 2001; “crossing generations: diVERGE”, National Gallery of Modern Art, Mumbai, 2003; “New Narratives: Contemporary Art from India”, Chicago Cultural Centre, Chicago, 2007; “Tiger by the Tail! Women Artists of India Transforming Culture” – Women’s Studies Research Center, Brandies University, Massachusetts, 2007-2008; “India Xianzai: Contemporary Indian Art”, MoCA Shanghai, 2009; “Making Worlds”, 53rd Venice Biennale, Venice, 2009; Fifth Beijing International Art Biennale, National Museum of China, Beijing, 2012; “The Eye and The Mind: New Interventions in Indian Art”, Guangdong Museum of Art, Guangzhou, Shanghai and Beijing, China, 2014-15; “Continuing Traditions”, Musée de la Toile de Jouy, France, 2015. Shuddhabrata Sengupta from The Raqs Media Collective. The Raqs Media Collective was founded in 1992 by Monica Narula (1969, Delhi), Shuddhabrata Sengupta (1968, Delhi), and Jeebesh Bagchi (1965, Delhi) after they completed their studies at the AJK Mass Communication and Research Center, Jamia Millia University, Delhi, while working together on their first—now lost—16mm film, “Half the Night Left, and the Universe to Comprehend”. 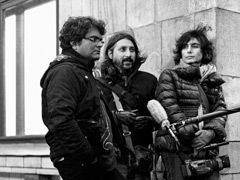 Raqs Media Collective enjoys playing a plurality of roles, often appearing as artists, occasionally as curators, and sometimes as philosophical agent provocateurs. They create installations, make videos, photographs, print and online works, play with archival traces, make exhibitions and art interventions in public spaces, write essays, enact lecture-performances, engage with pedagogical procedures, edit books, design events, and foster collaborations. They have worked with architects, scholars, coders, writers, designers, translators, performers, artists, curators and theatre directors, and founded processes that have become an influential force in contemporary intellectual and cultural life. In 2000, Raqs co-founded the Sarai initiative at the Centre for the Study of Developing Societies in Delhi, and the Sarai Reader Series, which they edited until 2013. Sarai was a pioneering platform for inter-disciplinary research and independent practice that brought together, theorists, researchers, artists, media practitioners and activists from all over India to pursue independent research projects on the urban condition in contemporary India. 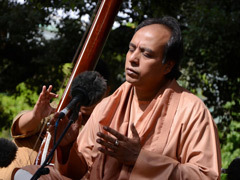 Pandit Ritwik Sanyal is a Dhrupad Singer, Guru, Professor, Composer and Writer. His musical journey started at a very young age with rigorous training in the Dhrupad style in Mumbai with Ustad Zia Mohiuddin Dagar and Ustad Zia Fariduddin Dagar(1963-1974). He assimilated the Dagar tradition of Dhrupad and infused a new dimension to Dhrupad performances such as Sanskrit verses, modern poetry, inclusion of cello, flute, vichitra vina with voice, Dhrupad choir and fusion. His important accolades include the prestigious Kendriya Sangeet Natak Akademi Award Delhi awarded in 2013. He is a distinguished member of several well-known bodies, such as ICCR, Human Resouce Develpment Ministry, All India Radio, Resource. Currently he is a Professor of Vocal Music in the department of Vocal Music, Faculty of Performing Arts of Banaras Hindu University, serving for the last 34 years as a successful teacher, academician, and researcher.